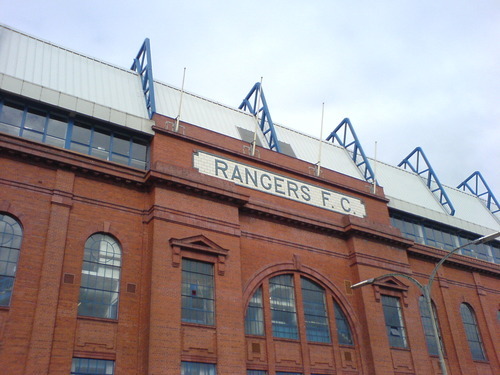 The sale of Ibrox Stadium may yet raise issues about the meaning of words and concepts used in insolvency law that don't appear to have been considered by the courts before, at least not in the precise context in which the ongoing Rangers saga presents them. In this post, we look in some detail at the various reports and statements issued by the club's administrators and wonder: what is an asset like a football stadium actually "worth"; how do you assess what is an "adequate" price for it; is "adequate" a notion that depends wholly on the circumstances of the particular sale; and, if so, does the word connote anything meaningful or give any useful guidance at all, particularly in the context of administration? The last set of accounts lodged at Companies House by The Rangers Football Club plc were signed off on 22 September 2010. In the preceding year, gate receipts and hospitality sales had amounted to £25.8m, sponsorship and advertising income to £2.9m, broadcasting revenue to £3.8m, “commercial income” to £21.7m, and royalties to £3m. Other sources of income gave a turnover of £56m. Operating expenses were £44m. Operating profit was roughly £5m. On one view, not a bad result. 6.4 Should a CVA or Scheme of Arrangement not be possible, the Joint Administrators would look to pursue the second objective which would involve a going concern sale of the business and assets of the Company. This would enable the business to continue, subject to approval by the relevant football authorities, under a different company registration number. 6.5 The Joint Administrators’ strategy for trading the business whilst seeking a purchaser is explained in Section 7 below, however valuation advice confirmed that a sale of the business and assets as a going concern would realise a far higher value than if the Company were first to be wound up. There are a number of classes of asset including, the player contracts, Ibrox Stadium and Murray Park whose value would have been significantly impaired should the Company have ceased to trade in the first instance. The Joint Administrators are satisfied that the costs of trading the Company are far outweighed by the potentially enhanced value which would be achieved by either a CVA/Scheme of Arrangement or a going concern sale of the business and assets. Offers received to date from interested parties fully support this position. The ability of the Club to complete its outstanding fixtures for the remainder of the 2011/2012 season and trade as a going concern. The preservation of value in player contracts which would not be available in a structured wind-down scenario. The preservation of employment and corresponding reduction in unsecured, preferential and non-preferential claims against the Company. The preservation of the Club’s status as a member of the SPL and the SFA. The safeguarding of SPL prize money due to the Club in May 2012. The enhanced ‘going concern’ value of the Club. 9.2 Contact has also been made with parties who were known to have previously expressed an interest in acquiring businesses in similar and associated sectors to ensure that they were made aware of the opportunity to acquire the Club and/or the business as a going concern. 9.5 The Joint Administrators originally requested indicative offers from interested parties by 16 March 2012 and continue to liaise with those interested parties who have submitted an indicative offer in addition to other prospective purchasers who have emerged following this deadline. A deadline for best and final offers has been set for 4 April 2012. It is not appropriate for the Joint Administrators to disclose any more detailed information in respect of the ongoing sale process. 9.6 It is likely that a sale will result in either an exit from the Administration via CVA or Scheme of Arrangement or there will be a going concern sale of the business and assets. The sale structure will be dependent on, amongst other things, the preference of the prospective purchaser and the ability to obtain control of RFC Group’s majority shareholding. 9.7 Further details regarding the exit route from Administration will be provided in subsequent reports. 9.11 The Company’s base of operations is within Ibrox Stadium, a UEFA 5 star rated, fully equipped and functional football stadium which covers approximately 6.9 hectares. The UEFA 5 star rating allows the Club to host UEFA Champions League and Europa League finals. 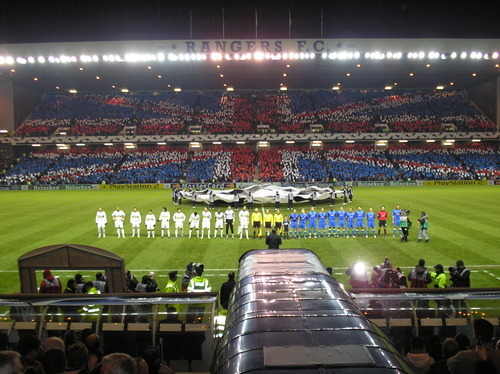 9.12 Ibrox Stadium has an all seating capacity of 51,082 and is regularly sold out for the Club’s home game fixtures. For the 2011/12 season, there were 37,918 season ticketholders with season ticket prices having been frozen for the previous three years. 9.13 The Joint Administrators’ agents, Lambert Smith, were appointed to provide an indicative valuation of Ibrox Stadium on an existing use and alternative use basis. 9.14 Murray Park, the Club’s modern fully equipped training centre covers approximately 15.8 hectares. It was opened on 4 July 2001 after a £14m redevelopment. The training centre is regarded as one of the best in Europe. “17.1.6 That the Joint Administrators may propose such CVA(s) or Scheme(s) of Arrangement as they deem appropriate and see fit, subject to the outcome of offers. “4.12 Due to the high level of media coverage that the Administration has received in the national and international press, the appointment of the Joint Administrators and the proposed sale of the Company or its business and assets has become known throughout the wider football and investment community. “4.17 Following the extensive marketing of the Company and the extensive sale process, an offer was made by Sevco 5088 Limited (“Sevco”) to make a loan on certain terms (explained below) in conjunction with the purchase by Sevco of the Group Shares. and proposes a CVA in respect of the Company, the benefits of which are outlined in paragraph 2.10. The CVA proposals would have meant a return to creditors of a few pence in the pound in the pound. They were considered at a meeting of creditors on 14 June. 49 creditors voted in favour of the proposals and only six against. However, one of those voting against was HMRC whose claim was valued at over £94m, around three times the claims of all the other voters. So the proposals were rejected and in due course the assets bought by Sevco. Now, in fact, some of these “assets” were not actually the administrators’ to sell, at least not without the cooperation of others. The Joint Administrators' report suggests at certain points that various interested parties were going to purchase the "history" of the club but unsurprisingly that isn't listed as an asset. And just as you can’t buy “history”, you can’t just sell SFA membership or a share in the SPL. Similarly, the players were entitled to object to their contracts transferring to anyone else and so the assets comprising the contractual obligations which they owed to the company could not simply be sold to Sevco. Nevertheless, that still left a substantial set of assets. The 2010 accounts valued the heritable property (including Ibrox and Murray Park) “based on their recoverable amount” at roughly £120m (and the administrators put this at around £113m). The value of the “High Court Proceedings” (a claim against the company’s former solicitors) is no doubt difficult to assess and depends on the strength of the case and prospects of success, not just the sums nominally claimed, but Duff & Phelps have subsequently reported (presumably on legal advice) it as being potentially “in excess of £25,000,000”. (Though we see that there are other unrelated claims against the firm for which which its insurers are declining to extend cover). The “Player Transfer Fees” were valued at £2m. So, back to that word “obliged”. Sevco did a deal which meant that if the CVA proposal was rejected (and many people at the time were voicing the intuitively attractive argument that it was unlikely HMRC would do anything other than reject it) then they would be “obliged” to pay £5.5m for assets valued at between £140m and £150m. No doubt it is accurate to describe both parties to a binding contract to be under a set of mutual obligations but to do so perhaps masks the fact that one of them may have struck a better deal than the other. Perhaps it would be the one who gets assets valued at 30 times what they paid for them. Of course, there’s a question begged in all of this. What does it mean to say that something is “valued at” anything? The trite truism is that something is only worth what someone will pay for it. Well, of course, but there ought to be, and is, more of a science to valuation than that. It may be a kind of social science like economics but the point is that people are prepared to pay what they are prepared to pay for reasons. These reasons tend to recur. They can be identified, measured, assessed and used to predict what it is that buyers will probably be prepared to pay for the thing being sold and, so, come to a view of its "value". The relevant considerations typically include what buyers would have to pay, or have previously paid, someone else for the same kind of thing (so you’d look at past comparables, demand, scarcity), the cost of making it themselves (construction costs) and what profit they will get from using it, either as it has been used or in some alternative manner. But before you get there, there are also different bases on which to approach the assessment of value. There are different assumptions of fact or circumstance which can be made. There’s a conventional division between the “going concern” value and the “break up”, “forced sale”, “salvage” or “liquidation” value of the assets of a business (though interestingly, these phrases seem to be falling out of favour). Superficially, it’s a distinction which seems obvious and easy to understand. It’s a bit like the whole being worth more than the sum of the parts. So, it’s agreed that Sevco bought the assets of the company on a “going concern” basis. That makes sense. They are continuing to run Rangers as a football club. They are fighting to have the players’ contracts transfer over under the Transfer of Undertakings (Protection of Employment) Regulations. It’s not as if Asda bought Ibrox with a view to demolishing it and building a hypermarket or a construction company bought it to do the same and build houses. So, what about the factors we suggested as relevant to valuing an asset? Sevco wanted to buy the business that had been run from Ibrox in order to continue running it in order to make a substantial profit. To do that, it was essential for them to get their hands on a large football stadium, presumably ideally one located in the Govan area.There wasn't another one on the market and the time and cost of constructing one would have surely approached the value stated in the accounts, had Sevco found somewhere to do it and been allowed to do so. We don't want to labour the point but do Sevco not seem to have got something of a bargain and paid much closer to a break-up price for going concern value? In short, could the administrators have got more out of them? The point of all this is that it is expected that BDO are going to be appointed liquidators to the company. They will be there to advance the interests of the general body of creditors. As an aside, it's been interesting to see who they are. There's HMRC of course. There's Ticketus, British Gas, Business Stream. There was Manchester City, Arsenal, Chelsea, Celtic, St. Etienne, Heart of Midlothian and Dunfermline Athletic. There's a series of large law firms. There's Murray Group. Depending on your sense of propriety and your particular allegiances, your heart may or may not bleed for every last one of these but, on the other hand, there's also a large number of much smaller businesses, local and otherwise, as well as individuals who have submitted claims as creditors and who face substantial losses. The liquidators would be charged with advancing the interests of all of them. There was undoubtedly a transfer of assets to Sevco. However, the transfer was effected by the properly appointed administrators of the company. The Insolvency Act 1986 gives administrators the power to sell assets belonging to the company and here the Joint Administrators had further sought, and gained, the creditors’ explicit approval to sell as they judged fit. So, could the sale be open to competent challenge under s242: surely it was by administrators (who themselves have powers of challenge) and not an “alienation by the company”? We haven’t been able to find a case where a liquidator appointed to a company has made a challenge under s242 to an earlier sale by an administrator who had been explicitly authorised by the creditors to carry out that sale. On the face of it, though, such a challenge appears competent. A liquidator’s role is to wind up a company by realising its assets for the benefit of creditors and then causing it to cease to exist. An administrator’s first job, if he can, is to rescue the company and he has wide powers to do that. In carrying out those powers, paragraph 69 of Schedule B1 to the 1986 Act provides that he is acting as agent for the company. So, he is authorised to bind the company, as its agent, and is not acting in rem suam. Sale by an administrator is in fact sale by the company and any sale by the company which occurs before the appointment of a liquidator, even though after a prior administration, appears susceptible to challenge under s242. So, as and when BDO are appointed, it appears that they or indeed any creditor could make a competent challenge under s242, despite the fact that the creditors explicitly authorised the sale they would then be challenging. And if that happened, the burden would fall on Sevco to persuade the court that what they paid for the assets was “adequate consideration”, under s242(4)(b). Could they really claim that £5.5m was “adequate consideration” for assets which were valued £150m and which were essential to their plans to carry on the business? In fact, in the interim report published recently, it appears that only £1.5m of what Sevco paid was ascribed to the heritage. That is heading towards 1% of its ostensible value. Duff & Phelps had a firm of valuers assess the worth of Ibrox on both going concern and alternative use bases and we have to presume that, however extraordinary it appears on the face of things, the figure paid by Sevco is in line with one of them. Perhaps we need to interpret the phrase "adequate consideration" in a way that means "adequate in the circumstances", with "circumstances" including reference to who is actually conducting the sale and, specifically, if it is by an administrator who might face a situation where it would be unreasonable to expect him to get more than a liquidator would for the sale of assets. However, would that approach be in line with the commercial reality or true nature of this particular deal? The administrators have repeatedly characterised what they intended to do as being a going concern, not break-up, sale of the assets. Their recent report reveals that between 14 February and 29 June they incurred trading losses of £3,956,375. The explanation for incurring losses of that order was precisely that they had to be incurred to secure the benefits that continuing to trade would bring: explicitly, a much greater price for Ibrox and the other assets than would be obtained otherwise. 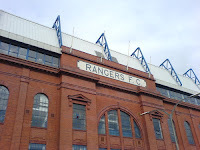 Ibrox stadium is, in the hands of a large football club, an essential element to the production of an enormous turnover and, potentially, profit. The 1986 Act gives no guidance on how to assess the “adequacy” of the consideration for an asset but might it not be argued that something closer to the going concern value, let alone the figure stated in the company’s accounts, would be a fairer assessment of “adequacy”, in the circumstances, than a fire sale figure? The idea of a “liquidation” value surely implies the severing and sale of the various parts of a company as a last alternative, not simply that the sale is being carried out by an insolvency practitioner. Even a liquidator, and explicitly an administrator, may be able to sell a company as a going concern or sell the entirety of its assets in something that approximates a going concern sale. Remember, we are not in any way judging or criticising the conduct of actual or imagined administrators. We are not talking about the kind of claim made in Re Charnley Davies (No 2) Ltd. or any kind of challenge to the conduct of the administrators under paragraph 74 of Schedule B1 to the 1986 Act or otherwise. Here, after all, the creditors approved that conduct, in advance. We are not querying the fact that administrators have the right, and may indeed have the obligation, to decide quickly and in advance of any creditors' meeting, which assets to sell, to whom and for how much. We are involved in in a different exercise, the one provided for in s242, which requires comparing what a purchaser has paid against what he has received. On the face of it, the terms of s242 require an objective assessment of whether the purchaser paid an "adequate" consideration for what he got. As has been reported elsewhere, Sevco think that "on a bad day" they got something now worth £50m. This isn't after any passage of time, or hard work, or development or integration into some other business but a few days after they bought it. They could, of course, be wrong but if not how could £5.5m be "adequate" payment, whatever the circumstances of the sale? If a company sold an asset for a tenth, let alone one one-hundredth, of its value shortly before a liquidator was appointed then there would certainly be a s242 challenge. If assets become worthless, and if others can buy them for a song, when an administrator is appointed then what exactly is the point of administration and what can anyone legitimately expect of an administrator? So, in the present case, should the adequacy of consideration, even when the sale is by an administrator, not be assessed by reference to other than liquidation value, allowing the court a fairly wide discretion as to what “redress” it felt it appropriate to order, in terms of s242: perhaps, say, payment of a further sum by Sevco? On the other hand, what would be the implications of allowing such a challenge? Could anyone ever buy anything from an adminstrator without worrying whether a court would later order them to pay more? Perhaps any court would be reluctant to second-guess the views of independent expert valuers as to do so would leave parties who buy anything from administrators never quite sure whether a judge might later come to his own view of what they should have paid and demand more money from them. Like heritable creditors selling security subjects when they have called up a mortgage, perhaps the test for administrators is the reasonableness of the efforts made, rather than simply a question of the sum of money obtained. Certainly, Duff & Phelps could scarcely have got more publicity for the fact that the club’s assets were on the market. A creditor in a standard security having right to sell the security subjects may exercise that right either by private bargain or by exposure to sale, and in either event it shall be the duty of the creditor to advertise the sale and to take all reasonable steps to ensure that the price at which all or any of the subjects are sold is the best that can be reasonably obtained." In contrast, s242 has nothing to do with how hard the seller tries. That makes sense. The mischief aimed at is disposal by a company at undervalue, even (and perhaps particularly) good faith disposal in a desperate attempt to stave off looming insolvency. If a company can't get adequate consideration for its assets during the relevant period before it is wound up then, the implication is, it isn't relevant how hard it has tried. It simply shouldn't sell them at all because to do so will prejudice the general body of creditors. If it does sell, a subsequent liquidator can look to the purchaser for some kind of redress. But is this the right approach when an administrator sells? How can a court assess "adequacy" of consideration then and would it not be better to set for an administrator a standard like that set for a secured creditor by the 1970 Act? It's only once the notion of a break-up or liquidation value becomes relevant that circumstances are complicated and the idea that there is an objective test for "value" or "money's worth" becomes problematic. It's accepted that the value of assets severed and sold after closure of a business will be much less than their going concern value and so the latter might not be achievable in the circumstances. We can't see any clear answer to all this, given the apparently unambiguous terms of s242. On balance, we think it would be unattractive if “adequate consideration” must always mean nothing more than “consideration obtained after taking all reasonable steps to get the best price”, at least not if "reasonable efforts" comprise nothing more than marketing and then selling for the best price offered. That's not what s242 says and, anyway, any best offer may surely still be short of adequate. We can't see that it has to be right that “adequate consideration”, even when the asset is bought from an administrator, can never be more than a break up or fire sale figure. We don't see that there is a reason in principle to prevent a court deciding that 1% of value is not "adequate consideration". On the other hand, we can see the practical problems that would flow were the courts to have such powers of review and the ability in effect to rewrite the terms of commercial bargains. As a matter of both principle and policy the courts have always been entirely unwilling to interfere in commercial life in that kind of way. So, perhaps the only way to reconcile all this is to approach it from the other end entirely. Perhaps we need to recognise that the values ascribed to assets in a company’s accounts, and in particular assets such as football stadia, are in effect meaningless and bear no relation whatever to what sale of the assets might actually realise for creditors. Although we are used to assuming that the value of land and buildings is pretty constant and predictable, we should perhaps realise that that is only in the context of an ongoing market in land and buildings. Come insolvency of a company, there may be plenty of other apparently valuable "assets" on its balance sheet which will realise nothing for a liquidator: "goodwill" for example. As we say, we're really not sure what the answer is but we'd be very interested to see if the liquidator or one of the creditors decides to ask the question.